With the advent of the rainy season, motorists must prepare for the worst-case scenario when it comes to their vehicles. Vehicles take a lot of beating during the wet, wild, and dangerous rainy season, so cars, trucks, jeeps and vans must be in tip-top shape before they are ridden. For Michelin Tires, safety is the No. 1 concern. Thus motorists must take heed of the following important advice. 1. Listen to weather reports. Check out newspapers, television, radio and the interneteveryday to have an idea about the weather. If it’s raining, look for alternative routes that are not susceptible to floods. If possible, postpone your trip and wait until the weather clears. 2. Check everything thoroughly.Look for leaks, broken lights, or dangling wires. Double check your radiator, engine oil, wheel alignment, and tire pressure. Always bring a bag or container with an umbrella, flashlight, car tools, and even a mini-radio. It always pays to be prepared in case of an emergency. 3. Keep your windshield clean and clear. Wipe away all dirt, especially the sticky ones. Test if your wipers are working. Good vision is your number one friend during thunderstorms and heavy downpours. 4. Don’t neglect your vehicle’s under belly. Floods, puddles, and canals can leave stains and mud on your chassis. This can hamper your car’s performance in the long run. Use a rust-inhibiting chemical spray for the different areas under your vehicle in order to keep them looking brand new. This will also keep your car in better condition for years down the road. 5. Choose appropriate tires for the weather. During heavy rains or floods, a car may lift off the road because its tires may not be able to disperse enough water beneath its treads to provide a strong grip on the road. As a result, the car may lose contact with the road, which can result in loss of vehicle control or something even worse. The tire treads’thickness and design, materials used, and the proper tire pressure all contribute to how firm its grip will be on the roads. Michelin Tires offers different tire models that are specifically designed for various kinds of weather. 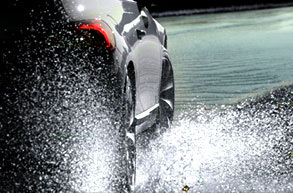 Choose a tire with good traction which can brake well on wet and slippery surfaces. Visit the Michelin Tire Selector at www. Michelin.com.ph that can recommend tough and long-lasting tires designed for the rough and wild roads of Metro Manila this coming rainy season.